I’ve been scared to write this for so long. Part of me wanted to share it and another part desperately didn’t. Looking at the photo on the left makes me feel terribly sad – at the time this photo was taken (June 2012) I was overweight, unhappy and unfit. But I was too scared to admit it. Or do anything about it. 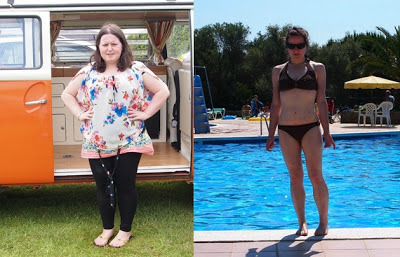 I had been overweight for the best part of ten years, and had always hid under layers of clothing, and endless scarves. I always had to cover up in any situation and never dreamt that one day in the future... I would be able to wear a bikini whilst on holiday. Leading up to the holiday I was so anxious about what to wear and what to pack because my wardrobe was no longer ‘mine’. Nothing fitting and worse still I felt a stranger in my old clothing, it was a struggle and I never thought losing weight would mean throwing away my entire wardrobe and starting all over again. Even though the old photos make me feel incredibly alienated and disgusted, they will always have a purpose. Body image and weight is such a personal issue, and this has undoubtedly been my biggest challenge. I’m not perfect and never will be, I will always be insecure and lack great confidence in myself, but to finally have achieved something I never thought was even possible has taught me that if you want to make a change in your life - there is only you who can make it happen. To finally be able to walk down the street without a shield of guilt so tightly wrapped around me, to be able to go into a clothing shop and actually enjoy trying on clothes that fit and to have someone tell me I look beautiful and for me to believe it for the first time in my life – it's emotional for me to express into words how much of an impact this has had. How amazing for you, not the weight loss but the emotions you have from losing weight. I've lost a couple of pounds recently and it's so bizarre being able to wear slightly different styled clothes, throwing clothes away that you never thought in a million years would be 'too big'. I remember throwing a pair of pj's away recently and the fact that something usually meant for slobbing around in, didn't matter how big it was was now ridiculously big was a great mile stone. I'm glad you now have the confidence you deserve. Fantastic! I lost 5 stone and had to completely start with a new wardrobe. Even down to knickers being too big. The changes in your head take longer to adjust to, years in my case. I look at old photos and its just not me any more. Its been 14 years now and I hope some time in the future you can feel the same as me and look back and feel proud of what you've achieved. Good for you girl, I've put weight on since moving to the US (combination of US potions and working from home), I could probably do with loosing weight but I don't know were to start to be honest. You've inspired me to work a little harder at doing something about it. You look absolutely amazing, you really are glowing! This is fantastic and I am so pleased for you. You should be very proud of your achievements. It's great that you posted this and have the other photo because it can be a constant reminder of how far you have come. I've had some personal issues to overcome in recent times and, although different from yours, I can relate and I realize how much dedication these sorts of things take. Wishing you the best. You look Fab!! Can I ask how you managed it? I piled on 3 stone during my time in uni, I dropped 2 of them before my wedding but since then they have inched back on and I just cant seem to get enough motivation to shed them again! And I really want to my size 12 wardrobe is no longer fitting and I refuse to start buying size 14 when everything I have is so pretty and perfectly good clothing, just gotta drop about a 1 stone to get back into most of it nicely!